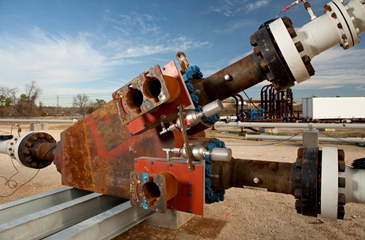 The Oil States QCS Director Wye and the Dual Director Wye are bi-directional, piggable Y-shaped fittings for shallow and deepwater subsea pipeline applications. The Director Wye permits pigging and cleaning through one predetermined leg. It uses a perforated diverter sleeve to direct the path of the pig. The diverter sleeve will accept bi-directional pigging in the main line. The perforated sleeve still permits unobstructed flow to continue through the lateral branch. The diverter is activated externally via ROV or diver assist. The Dual Director Wye permits pigging and cleaning of both the main and lateral lines. It uses two independent diverter sleeves to direct the pig and can be activated via ROV or diver assist. The internal sleeves are perforated to permit unobstructed flow during operations. Pigging operations may be performed in both directions. See Dual Director Piggable Wye animation here. 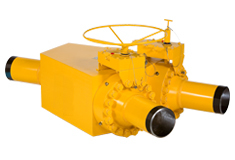 Available in symmetrical or asymmetrical designs to accommodate specific pipeline configurations. Utilizes a thirty-degree angle of entry to ensure a smooth transition for the pig without risk of hanging up. Manufactured from a single-body forging or casting to ensure consistency of materials and workmanship. 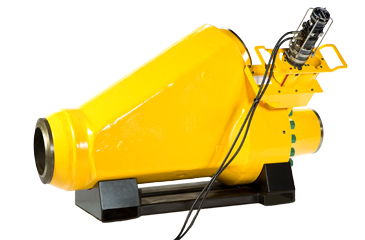 Standard weld ends can be provided with additional configurations upon request. ANSI pressure Class 300 to 2500 and API 6A ratings 2000 to 10000. Manufactured from a single body forging or casting to ensure consistency of materials and workmanship.